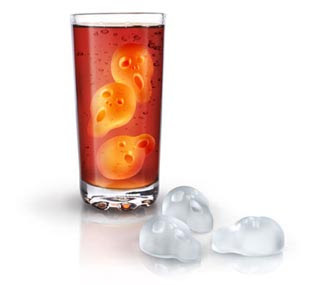 I am so buying this Chiller skull ice mold right now. I can think of sooo many uses for this. Not just Halloween - think what a festive goth Christmas party you could throw, tossing two or three of these in every punchbowl. This blows me away, it's so awesome. Edvard Munch's The Scream in ice cube form. I have no idea how I hosted so many goth cocktail parties before now, without this. As an extra cool touch, the Cold Blooded vampire teeth ice cube mold comes in a coffin-shaped package. You'll probably just throw the packaging away, but it will be really cool to look at until you do. Meanwhile, drop a set of icy fangs into a friend's highball glass as a surprise. Bonus if you make these out of cranberry juice or red-colored water. 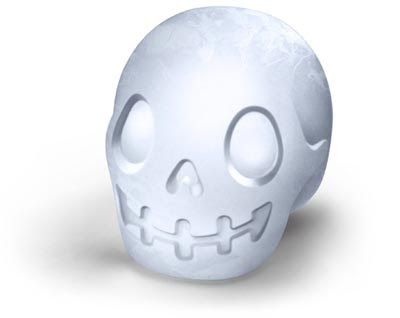 I use these Bone Chillers skull-and-crossbones ice cube molds year round, not just at Halloween! I'd be pretty tempted to color the water green or brown when creating these Alien cocoon ice cubes. I love the concept of this alien head ice cube mold, but I'm not sure my guests would understand the shape that was floating in their glass. If I served this to guests in a cocktail, I'd have to explain why their ice cube was shaped almost like a banana. I think it would lose something in the translation. Still, I have to give the manufacturer credit for what they were trying to do. I'm not sure when octopi became a symbol of steampunk. 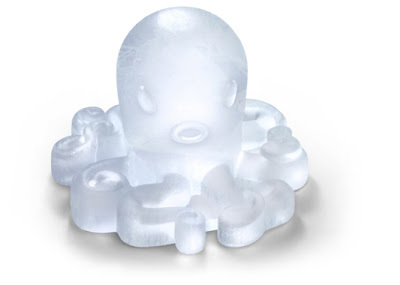 This Coolamari ice cube mold portrays a squid (calamari) not an octopus. The head shape is a bit wrong for steampunk, and so is the mouth. But still, in a pinch, you could use this to evoke a bit of flair at your next steampunk-themed dinner party. Note that this many "tentacles" could be really difficult to carefully remove from the mold without breaking. (I learned that lesson from the fragile tail on my favorite Seahorse ice cube mold).